Auto Windscreens has made access to its vehicle glass repair and replacement services even easier for Ogilvie Fleet’s drivers through the introduction of a new partner microsite integrated seamlessly with the fleet company’s own website. It is the first joint-venture platform for the fleet industry to offer direct web-based automotive glazing repair bookings. 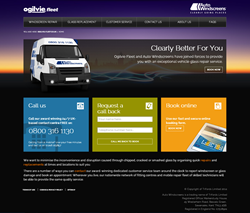 The micro site launched today, just a few weeks after Ogilvie Fleet’s own new-look website went live. It allows online bookings to be made with Auto Windscreens without end users having to navigate away from the Ogilvie Fleet’s site, creating a smoother and quicker customer experience. In addition to this, advice on windscreen cracks and chips along with other useful information and contact details are also accessible through the site. Joy Cooper, Sales Director at Auto Windscreens, said: “This is the first external platform with online booking functionality to have been developed specifically for one of our fleet partners. Its design is simple but effective, providing another route for Ogilvie Fleet’s customers to engage with us directly when their vehicle glass becomes damaged. “The online portal provides the same high standard of service as we offer by telephone call, including repair work authorisation and validation. We now hope to offer this value-added solution to other partners operating in the fleet management sector. Auto Windscreens is a preferred vehicle glass supplier for Ogilvie Fleet and has worked closely with the FN50 business to ensure the new platform conveys the same look at feel as the company’s own website. The micro site is the latest in a number of cutting edge technological initiatives implemented by Auto Windscreens over a three-year period, with recent additions including HPI Screen Check, which dramatically improves glass stock ordering accuracy. Auto Windscreens is owned by Trifords Limited, part of the Markerstudy Group. It is a leading automotive glazing company, serving customers throughout the UK and across all sectors from managed fleet to insurance. With a nationwide network of fitting centres and backed by a fleet of mobile service units, Auto Windscreens is an expert in windscreen repair and automotive glass replacement. The company head office and dedicated contact centre is based in Chesterfield.